Sunnybrook estates is an award winning wedding and banquet facility located in Toronto, Ontario. It boasts both indoor and outdoor locations to hold your ceremony and can be cozy and quaint or large and glamourous. The Vaughan Estate which is one of the mansions located on the property along with the Coach House and the McLean House. It boasts several unique architectural details including a slate roof and ivy covering the exterior of the building. The grounds in front offer lots of space to take wedding photos with large bridal parties and the century old building uses stoneworking methods which add lots of texture to the images we create at this fantastic venue. 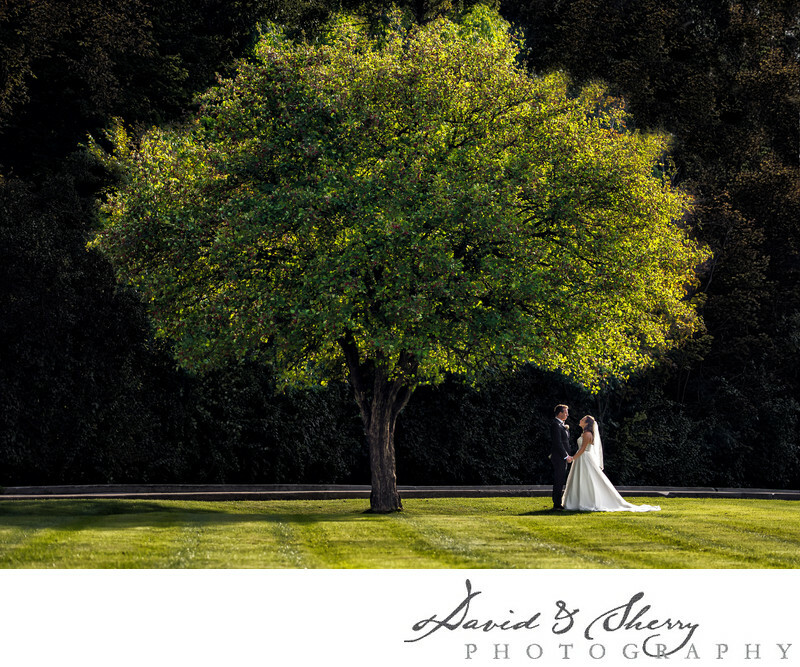 This photo depicts a bride and groom underneath a single tree in the courtyard lit by the sun against a dark forest background. The couple is rim lit by the sun allowing them to stand out in the image and be the focal point of this otherwise landscape style image. We love to capture wide portraits of our couples on their day so they have a large image to enlarge and put on the wall of their home to show to everyone who enters. It is a statement piece of art work announcing their new life together.